A report by Gartner agrees with IDC that PC shipments have contracted both globally and in the US, but the firm issued sales numbers that are significantly different than its market research rival. Just as IDC reported earlier today, Gartner noted Apple as being among only two of the top five US PC vendors to experience growth in PC shipments in the first quarter. However, Gartner figures that Apple's US market share is 9.3 percent (vs IDC's estimation of 8.5 percent) and calculates the Mac-maker's year over year growth as being an incredible 18.9 percent, nearly twice as much Mac growth as IDC reported (9.6 percent growth). 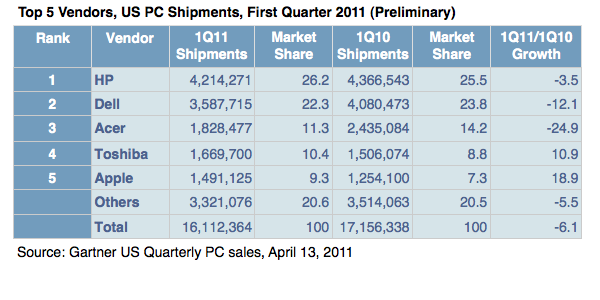 Both companies reported the total Q1 2011 US PC market as being in the ballpark of 16.1 million units, after each reported a discrepancy of nearly a million PCs in the year ago first quarter. However, Gartner placed Acer third, Toshiba fourth and Apple fifth in the US, while IDC had credited Toshiba with third place, Apple fourth, and Acer fifth. 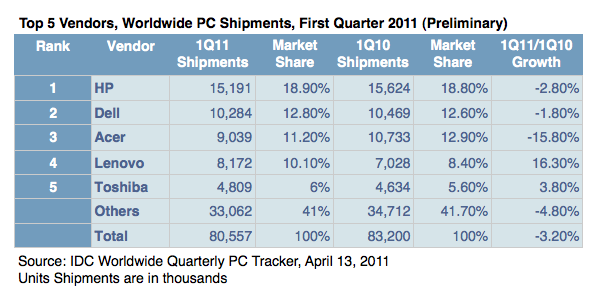 Gartner analyst Mikako Kitagawa was also more confident in blaming slowing PC sales on Apple's iPad than IDC was. "Low prices for consumer PCs, which had long stimulated growth, no longer attracted buyers," Kitagawa wrote. "Instead, consumers turned their attention to media tablets and other consumer electronics. 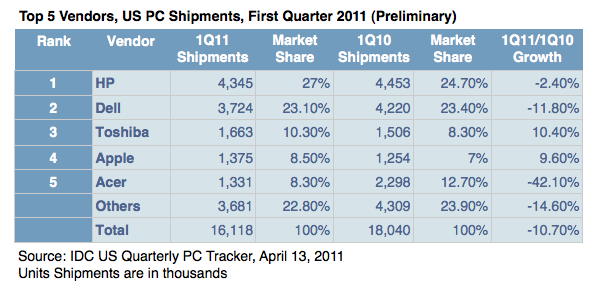 With the launch of the iPad 2 in February, more consumers either switched to buying an alternative device, or simply held back from buying PCs. We're investigating whether this trend is likely to have a long-term effect on the PC market." Like IDC, Gartner now counts iOS and Android-based tablets as "media tablets" in a separate category. Without counting tablets, the US PC market contracted by 6.1 percent, Gartner reckons, a slightly less dramatic loss overall compared to IDC's 10.7 percent figure for US contraction. Gartner's bad news numbers for the global PC market weren't quite as bad as IDCs but still remained in negative territory, with the firm estimating that global shipments fell by 1.1 percent, compared to IDC's figure of 3.2 percent contraction. 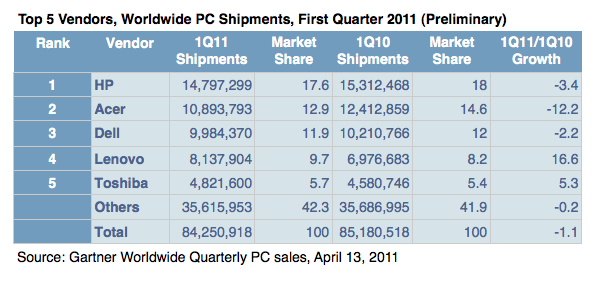 Gartner also placed Acer in second after HP, ahead of third place Dell. IDC had reported nearly 1.8 million fewer units sold by Acer, putting that company in third place behind a second place Dell.